comScore has named Madison Avenue vet and 360i founder Bryan Wiener its CEO, and added former GroupM digital chief Rob Norman to its board. The moves follow a protracted period of disarray for comScore, which had been the dominant supplier of digital media audience ratings, but has lost steam and share -- and some would say, market leadership -- to Nielsen. Wiener, who has served as executive chairman of 360i since turning the CEO role over to Sarah Hoftstetter, fills a CEO slot at comScore that has been vacant since Gian Fulgoni retired in November 2017. In a related move, Bill Livek is moving from executive vice chairman and president of comScore to become vice chairman and a special advisor to Wiener. The new roles are effective May 30. 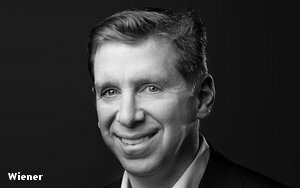 Current comScore board member Brent Rosenthal has been named non-executive chair, and Norman -- who has had advisory roles at a number of companies since retiring from chief digital officer of GroupM -- joins the board. The new management team couldn’t come at a better time for comScore shareholders, which have experienced a protracted series of restatements of the company's earnings. In late March, comScore reported current quarterly earnings for the quarter ending December 31, 2017 in a filing that included restatements of earnings for 2013, 2014, 2015 and its first public results reported for 2016 and 2017. Wall Street analysts say comScore’s operations and its marketplace esteem were negatively impacted by the distractions associated with its restatement and management turnover, although they believe it could become resurgent and muster serious competition vis a vis Nielsen, especially given concerns about its growing monopolistic control of both analogue and digital media. 2 comments about "comScore Taps 360i's Wiener As CEO, Rob Norman Joins Board". Ed Papazian from Media Dynamics Inc, April 23, 2018 at 8:44 a.m. The problem that all of the companies that have tried to compete with Nielsen is that, aside from technical nuances, none of them have demonstrated that Nielsen is seriously misrepresenting the way the national TV audience plays out in terms of who watches what and how often. The local rating scene is where Nielsen is more vulnerable due to the simple fact that most stations can't justify paying what is required to have national rating survey "quality"in their home areas. Larger panels are an advantage for comScore, but it needs a way to measure viewing, not just tuning, to compete with Nielsen, locally. Ultimately, I can see a future accomodation with Nielsen, whereby Nielsen uses the comScore panel to aggregate set usage ratings in all or many markets, then augments this with viewer-per-home findings from its peoplemeter-type measurements. Henry Blaufox from Dragon360, April 23, 2018 at 10:01 a.m.
Are comScore's financial reporting and control problems resolved once and for all, or will this still be a distraction for senior management?